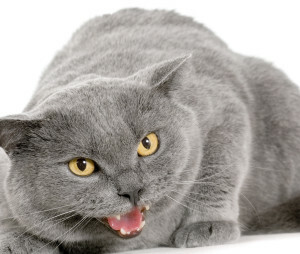 After obtaining your veterinarians advice and a clean bill of health for your cat, try to identify which of the following types of aggression your cat displays. Causes: You might unknowingly contribute to play aggression by using your fingers as toys. This sends a message that it’s OK to bite flesh. A kitten separated from litter mates too early might not have learned proper social behavior such as scratching and bitting. 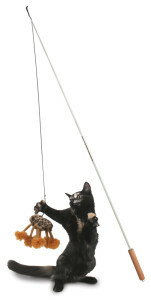 Solutions: Use an interactive (fishing pole) toy to put a safe distance between your cat’s teeth and your fingers. Use the toy to stimulate their natural hunting instincts. Allow them to attack the toy and show of their hunting skills. Schedule two 15 minute interactive sessions a day. Cats who don’t experience enough energetic interaction might ask for playtime through the attention-getting behavior of biting. In many homes, the only stimulation available to the cat comes in the form of people’s moving feet. If your cat attacks your ankles, it probably indicates a need for more play time. 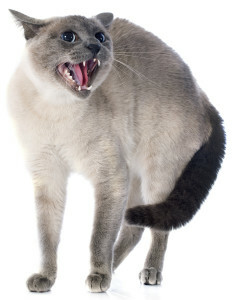 Causes: Redirection aggression can appear when the cat is stressed or in a situation that they can’t control. For instance, an indoor cat at the window spots an unfamiliar cat in the yard. Agitated, the cat jumps from the windowsill, runs to the nearest animal or human and attaches without provocation. You must then find what has caused the aggression in your cat. What has caused this unusual behavior. Solutions: Don’t try to hold or touch the cat. Move slowly and get them into a quite room by themselves (make sure shades are pulled and lights out) so he can calm down. It may take several hours, just let them alone and they will calm down. While the cat is in the room you must remove what triggered the situation, cover the window for days till he dissociates it from the episode. After several hours crack open the door (quite room) and let them come out by themselves, on their own time. Don’t try to hold or comfort them, just let them alone, they will come to you when they are ready. Don’t try petting them if they go to your lap, just sit still and give them more time to settle down. Take things slowly and quietly. Any signs of aggression, return them to their quite room. Causes: The cat feels they is superior to a particular person in the house. Some cats need to control their surroundings and react aggressively to interaction they don’t initiate. 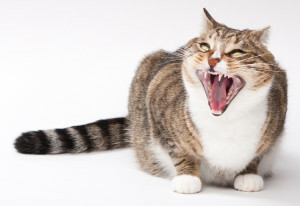 A display similar to petting-induced aggression may occur if you begin petting without the cat’s “permission.” The cat might bite or merely grab your hand. Reward positive behavior with a treat or affection. 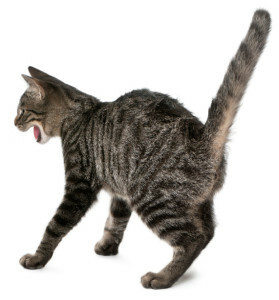 Clicker training (see our article onclicker training) often works with status-related aggression because the cat immediately makes the connection with the good behavior. Never strike or yell at the cat. Have the targeted person take over feeding duties, playing with the cat, and only in the evenings when the cat is more receptive. Gradually, additional sessions can be added during the day. After a week of behavior modification, the cat will began to relax. They will start associating the target person with positive experiences and eventually let them initiate petting sessions, demonstrating that concerned cat owners armed with knowledge can transform an aggressive cat into a loving, well-behaved pet.